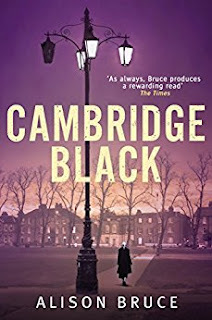 The first book in this series was entitled Cambridge Blue and when I recalled the book I remembered how much I had enjoyed it and how impressed I had been with this debut book. I was shocked to realise that Cambridge Black was the seventh in the series. I thought that Cambridge Blue was good but Alison Bruce has in the interim grown into a first class crime writer. I could not put this book down. In 1991 two young people are burnt to death in a house fire. Robert Buckingham was convicted of the crime and served 22 years in prison. His daughter Amy was just 4 years old when her father was convicted. She has always believed he was innocent. Now the sudden realisation of her father’s mortality galvanises Amy into seeking to prove his innocence. As Amy seeks to uncover new evidence to clear her father’s name in what is now a very ‘cold case’ she wakes the sleeping tiger and soon there is a murder. Interestingly, Amy is not the only one researching a cold case DC Garry Goodhew has only recently discovered that his grandfather was murdered and he too wants answers. Brought up mainly by his grandparents and still close to his grandmother he decides to look into the unsolved case. Two tantalising mysteries that both relate back to the early 1990’s. But the truth has a way of surfacing. Secrets that one thinks are long buried are sometimes closer to the surface than one thinks. Complex and intricately plotted this is a fascinating mystery as two seemingly unrelated killings have a number of coincidences no one can ignore. Except for the awful DS Michael Kincaid, who sole raison d’etre is for DC Goodhew to, as he puts it ‘crash and burn’. Apart from recommending this as a ‘must read’. I have only two things to do, one to read up the earlier books in the series and two, to make sure I don’t miss the next one. Most highly recommended. Alison Bruce was born in Croydon and grew up in Wiltshire. She has worked in all kinds of jobs, from admin to electro-plating and from DJ-ing to IT management. She didn't always plan to become a full time novelist but can't remember a time in her adult life when she wasn't carrying a notebook and pen and jotting down ideas. One day an idea grabbed her so strongly that she decided to tackle a full length novel. Alison had moved to the Cambridge area in 1998 and decided to make it the backdrop for the books because of its unique mix of characteristics. It is a relatively small city but has a worldwide reputation for education and science. On its doorstep lie tiny and relatively primitive rural hamlets yet it has an airport and fast rail links into London. It is traditionally English but multi-ethnic, vastly wealthy in places but under privileged in others. Alison Bruce has also written two non-fiction books, Cambridgeshire Murders and The Billington, Victorian Executioner, both published by the History Press.